It's now officially been one month since our last post and more than one month since my last post. However, with football winding down and personally not being a huge basketball or hockey fan, it's about that time to start getting excited about baseball season. As seems to be the current trend on Cardblogs right now, what better subject for my first post back than a look at the current Cardinals roster and the potential final pieces to the puzzle? Today, we'll start with the pitching staff. Option 'with' teems with potential dominance, while option 'without' reeks of inconsistency and predication. Both options will likely prove servicable to slightly above-average, but only the top option has the potential to be downright dominant. "With great reward comes great risk..."
I know it's Christmas Eve and everyone is supposed to be doing all those fun Christmas things, but after today's news, I can't stop thinking about baseball. Yes, while sitting in church and eating dinner with the grandparents, I spent the whole time thinking (and talking with my brother) about the Cardinals' rotation in 2007 and beyond - just don't tell the parents! So we know that Jeff Suppan found a new home with the Brewers to the tune of 4 years / $42 Million (link), and thanks to Derrick Goold of the Post-Dispatch (link), we now know the plan to fill out the rotation: resign Weaver and Mulder. I'll certainly miss Suppan - the guy wore the Birds on the Bat with pride, and who didn't love Soup's word of the day? Now I know to a lot of people, this isn't very exciting. How does that make us better, you might say, or weren't they disasters last season? I think that if you're saying that, you're missing the big picture - steady and reliable are great, but as any businessman knows, the more reward you want, the more risk you have to take on. Steady doesn't win you the World Series, at least not in this playoff structure - remember it was the 83-win, 2006 team that won it all, not the 100-win 2005 team or even the 105-win 2004 team. Chris Carpenter - He's a legitimate #1, a true ace and about as reliable as they come. He'll pitch 200 innings, at least, in 2007 - you can mark that one down - and another Cy Young-caliber season is more likely than not. If you average his best two years (2005 & 2006), you get a 2.96 ERA. Even if you're in the camp that all those innings will take a toll, a little regression still leaves you with a dominant pitcher. Anthony Reyes - After a rocky, inconsistent regular season, Reyes really came into his own in Game 1 of the World Series. In my mind, that 5.06 regular season ERA was a fluke. Bill James predicts Reyes will put up a 3.61 ERA. Thats very, very solid #3 if not borderline #2 material - not too bad for league minimum, don't you think? 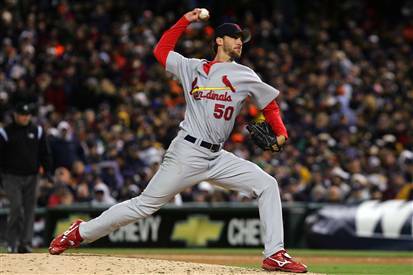 Adam Wainwright - Wainwright was a stud during the 2006 regular season, but in my mind, the postseason made him a STAR. The guy went out there in the most heated, tense moments of the playoffs, and although it wasn't always pretty (except those Beltran and Inge strikeouts,) he got the job done. I've heard lots of doubts about him as a starter - that he doesn't have enough pitches or doesn't have the stamina. Whatever - Adam clearly has the competitive drive to hang with the best of 'em, and he flat out has BALLS. Bill James predicts a 4.01 ERA for him, not bad for a first year starter, and if nothing else, he will be certainly above average for a back of the rotation guy. Kip Wells - Kip was just awful this year: 2 stints on the DL, only 2 wins, and an ERA over 6, but let's look at the positives. First of all, he WAS hurt this year and pitched for two AWFUL teams in Pittsburgh and Texas, so that was surely part of his pitiful performance. Plus, Wells has nasty stuff and Duncan absolutely loves the guy; he appears to be a classic Duncan rehab project. Let's also not forget that Kip has not once, but twice, put up an ERA under 3.6 (2002 and 2003.) If you put his best two years together and average them, you get a 3.44 ERA - and the guy's a veteran who's only making $4 million next year. Do I think he'll be that good? Probably not, but the guy's got nasty stuff and Duncan on his side, and keep in mind that his 1-year deal makes pitching well as important to him as it is to the organization. Jeff Weaver - When Weaver first came over, he was an absolute mess - after a few innings the guy looked like he'd just plain given up. After several months of working with Dunc, we saw flashes of brilliance, and by the end of September, he put it all together and emerged a confident, dominant starter. Jeff has always been known to have great stuff, but also to be a head case and terribly inconsistent. Still, the guy will give you innings, and we know he can shine. 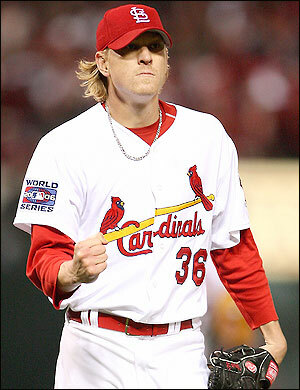 In 2002, Weaver put up a 3.52 ERA, and if you factor the DH rule, the number seems all the more impressive. Maybe I'm over-optimistic, but it seems to me that DreamWeaver has emerged a new man, and with another year of Duncan by his side, a sub 4 ERA seems more of a certainty than a question, and a mid 3 ERA is definetly a possibility. 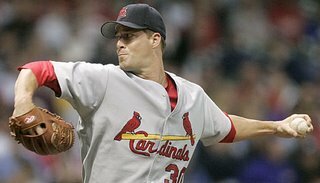 Mark Mulder - Cardinals fans everywhere are still fuming over the Mulder trade, and in hindsight, rightfully so. Still, I think the best way to do the trade justice is bring Mulder back. Despite all the criticism, Mulder's 2005 season was solid - a 3.64 ERA and 16 wins are nothing to sneeze at, especially when he's the SECOND best starter you have. Mulder was awful in 2006 but you have to give him his due - it takes a lot of gall to pitch hurt like that, especially in the contract year. Let's not forget that Mark has posted a sub-4 ERA four times in his seven years in the big leagues. The average of his top two years is even more impressive: a 3.29 ERA, which isn't even accounting for the DH in the AL. Is this realistic for Mulder in 2007? Probably not. Coming of such a serious shoulder injury, he'll probably have some struggles with control, but should be a solid contributer upon his return. Stop for a minute and just consider the ridiculous upside of this rotation, both in terms of '07 and '08. All six of these guys could legitimately post a sub-4 ERA, and four of them (Carp, Reyes, Waino, and Weaver) probably will. And let's say hypothetically that Mulder comes back strong before the deadline - you can move Wells or Wainwright to the bullpen, or trade a starter (probably Reyes or Wells) for that final piece at the deadline. After the season, Wells will be gone, and the Cardinals will probably sign Westbrook or Buerhle (or maybe both,) which would leave Reyes, or possibly Mulder, as a valuable trade commodity - think that big bat that we're missing would be so hard to get after all? Merry Christmas! Enjoy it - it's not very often that Santa brings something as awesome as a World Championship! I can't speak for my brother, but at least for me, I will be taking an unofficial posting hiatus until the Cards next signing or the signing of one of the Cards' outstanding free agents. 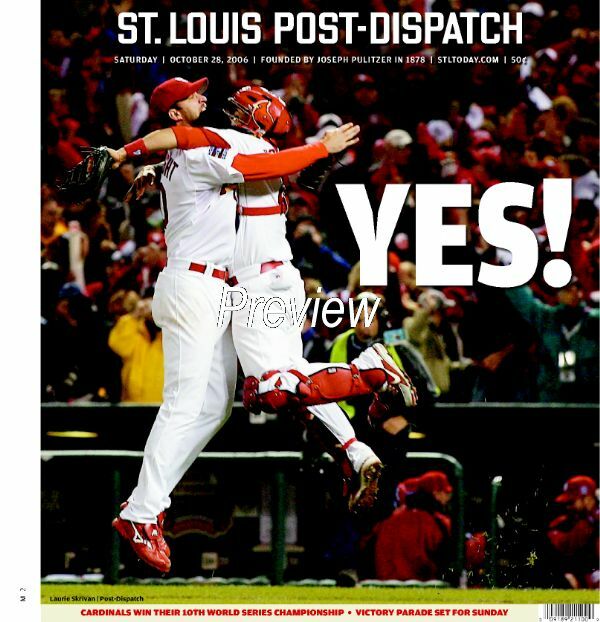 Thanks thus far to all of the readers and fellow Cardinals bloggers who have shown interest and support in our fledgling site. I'll leave the site temporarily dormant with the picture that made my year and still sends chills up my spine. As 2006 showed us, there are no sure things when it comes to starting pitching. 2007 will be no different for the Cards' starting 5/6/7/? (whomever they are), but the end results may be surprisingly superior (despite the many lingering questions). In the 2006 postseason, both Tony La Russa and Dave Duncan uncharacteristically put their faith in unproven youngsters (Reyes, Wainwright, Kinney, Johnson, Duncan) over more experienced veterans (Marquis, Looper, Encarnacion), and it payed off in the biggest way. Maybe it was a one-time, injury-induced anomaly, or maybe it was a longer-term shift in philosophy and a reflection of ownership's wishes to place more responsibility on the shoulders of its young players. The personnel moves thus far this offseason seem to point to the latter. With Izzy reportedly on the fast track to recovery, the worst-kept baseball secret in STL was finally let out of the bag yesterday: Adam Wainwright will move to the rotation (link). As I mentioned in a previous post, regardless of where you think Wainwright is better suited, the right move is to try him as a starter in 2007. If he tanks, the closer issue is resolved for 2008 and beyond. If he succeeds, a rotation spot is filled (at worst) adequately and affordably for at least the next 5 seasons. Either way, there will be a trickle-down effect in the bullpen in 2007, as we will better see how Kinney, Johnson, and Thompson (presuming he doesn't start) project over a full season, and in what roles. The same argument can be (and has been) made regarding Duncan in the outfield. The corresponding reality is that the Cards will need pitching depth. With, at the very least, Reyes, Wainwright, and Wells all in the rotation, there are and will be legitimate concerns about both injuries and ineffectiveness throughout the season. With no more sure-fire, consistent performers left on the FA market (save perhaps Suppan), it would be prudent of Jocketty and Co. to fill up on high-risk, high-ceiling talent. We may already have Narveson and Thompson waiting in the wings, but why not have 7 or 8 potential starters? I've beaten the first two to death, but why not sign both Weaver and Mulder and then go for a guy like Joel Pineiro (I'll defer to an awesome article over at Fungoes; link). That would leave you with Carpenter, Weaver, Reyes, and Wainwright as certainties and a true battle between both Kip Wells and Joel Pineiro for the #5 spot in spring training (were he to lose, I could see Pineiro as a very effective bullpen guy). I think it's ignorant to presume that all the pitching gambles will pay off, so having 7 or 8 potential answers to 4 questions (including a hopefully healthy Mulder at midseason) will at worst give you a security blanket and more likely produce a pitching surplus and potential trading chips (from both the rotation and bullpen). You may disagree and it may not happen, but such a scenario would certainly make spring training and every subsequent start just that much more exciting. Per Ken Rosenthal (link), Jason Jennings has been traded to the Astros along with Miguel Asencio for Willy Taveras, Jason Hirsh, and Taylor Buchholz. This fills the Astros' need/desire for a young, #2 starter behind Roy Oswalt (although whether Jennings stuff/track record is #2-caliber is debatable), while filling the Rockies' needs for a rangy center fielder and cheap, young starting pitching. This was the same package originally rumored to have pried Jon Garland away from the White Sox, however it is difficult to argue that Jennings is in the same class of pitchers as Garland. It is interesting to note that the reported deal was not contingent on an extension (or at least there has been no mention of one yet). Although I am not particularly high on any of the three Astros players involved, cheap high-ceiling talent is both valuable and hard to come by; we'll see soon if the Astros gave up too much. Although my Houston friend, CAH-TOWN is high on Sampson, the current rotation is a far cry from the Astros' staffs of recent years. For next season, Jennings is downright affordable at $5.5 M, so excpect the Astros to go hard after the top remaining FA of their choice. I expect it will be Suppan (after all, I already got my first projection from yesterday's post correct). I will ask CAH-TOWN to write a post on the Jennings trade in the near future, so look forward to "the enemy's" point-of-view. From the Cardinals' perspective, this only further limits the pitching options left available. Do not expect the addition of an unquestioned #2-type starter this offseason. ... Introducing the 2007 Cardinals starting rotation (as of today). Anyone nervous yet? 1) Jeff Suppan: The Cardinals would love to have Suppan back. From the beginning of the offseason, he was the closest to a sure thing of any of the "Tier 2" pitchers on the market. Over the past 3 seasons, Suppan has averaged 15 W's, a 3.95 ERA, and 191 IP. With Suppan, you know what you're getting: a durable, control pitcher that shows up consistently in the 2nd half and postseason and provides a positive clubhouse presence. However, on the flip side, Suppan also has/had one of the lowest ceilings of the "Tier 2" pitchers; he lacks overpowering stuff and is highly dependent on his defense (his peripherals are less than stellar). At Miguel Batista money (3 years, $24-27 M), I think this deal would already be done. However, in this market, with contenders such as the Astros, Blue Jays, and Giants still looking for a rotation stalwart and former teams (KC, Pittsburgh) bidding for his return, it's unlikely that Suppan will be had for less than Ted Lilly money (4 years/$40 M). Jocketty may still blink, but I just don't see a return engagement at those prices (and other than in perhaps SF, I don't expect Suppan will be the same pitcher). 2) Jeff Weaver: I have to admit, I am somewhat surprised by the Cardinals' relative lack of interest in Dream Weaver (or at least of that perception). He seems to be the exact type of pitcher the Cards would jump at re-signing. Save for two horrific years (2003 w/ the Yankees and 2006), Weaver has consistently been a durable, middle-of-the-rotation guy who displays occasional flashes of #2 potential (see the 2006 postseason) ... and he will only be 31 late next season. Even with the off-years included, Weaver has averaged 11 W's, a 4.58 ERA, and 195 IP over the past 5 seasons. Remove 2003 and 2006 from the equation and the line becomes an impressive 13 W's, 3.93 ERA, and 214 IP. Then consider, despite his postseason brilliance, Weaver seems somewhat undervalued in this hyper-inflated market (or perhaps it's because his agent is focusing on bigger clients). Weaver is certainly not the answer that Suppan is, but he also has a much higher ceiling. Towards the end of the regular season and into the postseason, Weaver looked more and more like the #2 starter he is genuinely capable of being. By challenging hitters on both sides of the plate instead of nibbling (which he did not do when he first arrived in STL) with both fastballs and breaking balls from a variety of arm slots, Weaver was downright exciting to watch. Weaver-STL Part II just makes too much sense for both sides. Weaver is a high-celing veteran who is willing to listen, perfect for Dave Duncan and Tony LaRussa. 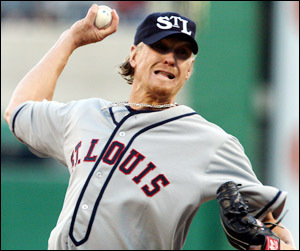 St. Louis is a low-pressure, NL city where Weaver could thrive. Unless Weaver holds out for more money or more years with a West Coast NL team like the Giants (which is a distinct possibility), I see this getting done, albeit not cheap. 3) Mark Mulder: I've covered this topic with some thoroughness. I think the Cards would like to have Mulder back, but only with a club option for '08. Maybe this stance will change if Jocketty & Co. lose out on both Weaver and Suppan. The safe bet is that Mulder goes west (AZ, SF), but in the end I think he ends up joining his buddy Zito (you better believe Minaya will overstock on pitching this time around). 4) The Rest of the Heap (Mark Redman, Tony Armas Jr., etc. ): Who really knows where these types will end up? Revisiting my domino theory argument from before, it will be highly dependent on how needs are filled by teams such as Texas, Toronto, SF, and Houston. If those needs are filled with the above Cards FA's (or a trade cannot be made), a guy like "All-Star" Mark Redman may come into play as a potential #4/5. I was originally repulsed by the propsect of Redman in STL, but upon further inspection, he could actually thrive as a Cardinal. At 1-2 years and $4-5 M per, Redman would give us a soft-tossing lefty (hey, maybe practicing against him would help our offense) who over the past 5 seasons (2 in the AL) has averaged 10 W's, a 4.59 ERA, and 186 IP. His peripherals leave much to be desired, but he has experienced a signifcant upward trend in his G/F ratio over the past few seasons, something that Duncan could probably work with. Barring the trade I predict below, I think Redman might in fact end up in St. Louis in '07. With regards to Armas, his potential is intriguing, but we've already got Wells, Reyes, and Wainwright from within that vein. 2) Pick Your White Sox Starter (Garland/Buerhle): First of all, I'm not totally convinced the Garland to the Astros talks are dead ... I think Houston wants a young #2 to plug behing Oswalt rather badly (see Jennings). Secondly, I don't think the Cards even have the necessary trading chips to fit with the White Sox unless they trade Reyes (Reyes, Encarnacion, multiple prospects ... maybe ? ), which is both unlikely and (in my opinion) unwise. As for Buerhle, I've also covered him rather in depth. If he does hit the market (which the White Sox really can't afford to do if they do trade both Garland and Garcia), he will probably fetch more than the Cards could offer. I'd like to see how he performs this year anyway. 4) Jon Lieber: I've never been a huge fan of Jon Lieber, because his performance seems so uneven from start to start, but in this market he could be a find (as he's definitely on the trading block). Over the past 5 seasons, he has put up a very respectable average line of 13 W's, 4.18 ERA, and 187 IP. The Phillies are said to be looking for a right-handed outfielder ... maybe Encarnacion would do the trick. However, given the cost of FA pitching I think Gillick will end up doing better. 5) Carl Pavano: For the first time in years, the Yankees are now dealing from a position of a pitching surplus. With Wang, Pettite, Mussina, Johnson, and Igawa slotted for the rotation and Hughes and Sanchez waiting in the wings (and don't discount the possibility of a mid-season Clemens addition), Pavano may be the odd one out. However, on the other hand, given the age of the rotation, Cashman could hang onto Pavano as an insurance policy. In the end, though, my gut feeling is that Pavano will likely be dealt. 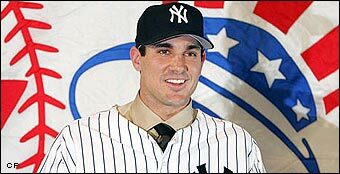 Despite how dismal his Yankee career has been thus far (the highlight was probably the picture above), he actually has some value as a trading chip given the combination of his potential/past healthy pedigree and the relative dearth of affordable, high-ceiling FA pitching. From the Yankees perspective, even if they are forced to eat a substantial portion of Pavano's contract, they are saving 1.5 times the amount paid by the receiving club, due to the luxury tax. Even for the Yankees, $15 M (b/c of the luxury tax) is a lot to pay for a safety net. From the Cards' perspective, injuries aside, Pavano was a guy they heavily pursued following the '04 season. The important clause is "when healthy" (reports are that he is), but when healthy in '03-04, Pavano was a #2 pitcher with #2 stuff and a Duncan-like G/F ratio; those two years, he posted an average line of 15 W's, a 3.62 ERA, and 211 IP. The Cards should do their due diligence on his medical status, but if healthy, Pavano could be a #2 workhorse (he just doesn't strike out as many batters as you might think, similar to Verlander). The Yankees won't just give him away, but for a Brad Thompson type, the Cards could very well get Pavano for $5-7 M/season. I think Jocketty takes the gamble, knowing that Wainwright and Narveson are waiting and ready. 6) Mike Maroth: I've already discussed Maroth at length. He'd likely be the equivalent of Mark Redman, except via trade. Given the Tigers desperate need for a left-handed reliever, I could see a trade of Flores for Maroth going down. However, the Tigers could just try Maroth in the bullpen as well, although I don't think they will. (and Blooper stays in the bullpen) ... breath easier. Keep your fingers crossed.